Im aware of the various plugins available and the issues related to using them but surely, given this text editor is used by a lot of programmers it would seem sensible to assume that a hex editor or binary editor would be a logical native addition to the program. I cant see it being a massive headache to implement this, even if its just a viewer that gets added without any of the commonly used hex/binary tools. There are converters to go from various character sets or encodings so why not offer a converter which converts the data into a binary view? Maybe a lot of other programmers (read contributers) can see it’s a massive headache to implement and even more important maintain a hex/binairy editor/viewer. Especially when there are suitable alternatives available for free. than a simple python script could do what you want. Oh yes ! Interesting suggestion, indeed ! I’m not speaking about the numerous free Hex editor, available on Net, with specific features ! Given the present location of the caret, your ( future ! ) Python script would just give us, in a new window, the hexadecimal representation of, let say, the 256 following characters ! And, in case of an user selection of text, limited to 256 characters, again, it would act, also, as above ! 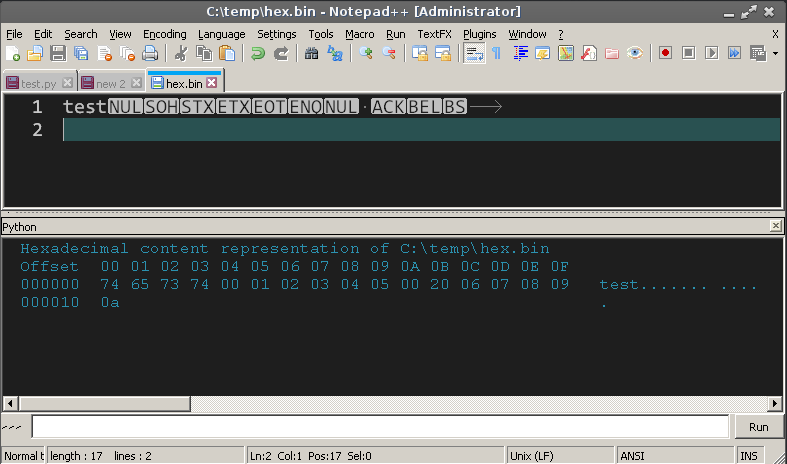 binary file, hold in memory and then try to map the selected text to the real data from file. But I admit, it is an interesting project. Thanks for your quick reply :-)) Don’t worry, Claudia ! I just thought about viewing hex contents of previously saved files, of course ! And I do like the Regex Tester's solution, with automatic creation of a new file, with the hex contents, in the secondary view, for easy comparing with the file, itself ! It should be useful, sometimes, when downloading files form Net, to find out which exotic characters are in. It could help us, also, to see all the bytes, used by specific character(s), according to the current encoding of the file ! good one and yes, this is my default hex editor as well - brilliant piece of software. TextFx has some “Convert text to hex” commands. Thanks for the replies and I think I need to write the tool to view the data in a browser so I might as well just write that first because its going to be handy to have.